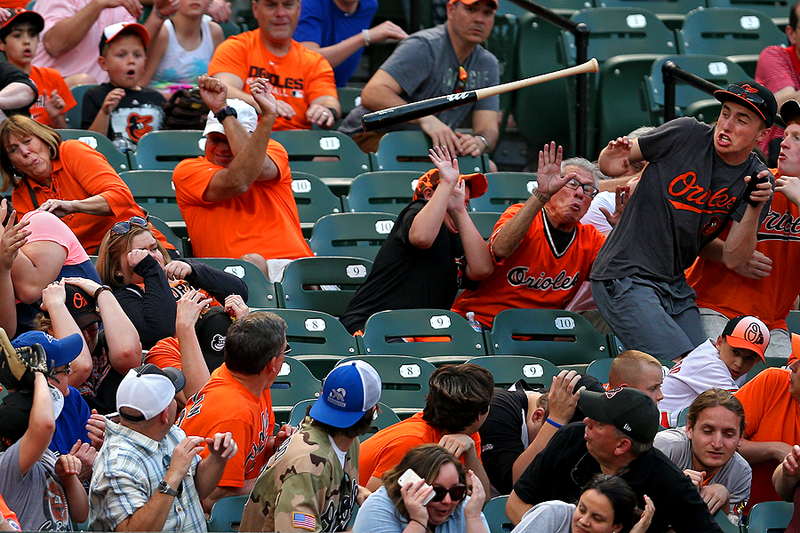 "Fans attempt to dodge the loose bat of Josh Donaldson #20 of the Toronto Blue Jays in the third inning against the Baltimore Orioles at Oriole Park at Camden Yards on May 12, 2015 in Baltimore, Maryland. " As photographers, we build up getting to the biggest events in the world. But the reality is, and something I always share with students, that the best pictures often come from the daily assignments. It's easy to downplay something like a regular season game early into the year, however, the biggest moment in sports history can occur during that match-up - one must be prepared. The other night, the Toronto Blue Jays came into town to play the Baltimore Orioles. Aside from an early season win, there wasn't much on the line as playoffs are months away. That didn't stop me from approaching the game as a big deal though. In the first inning, a bat was broken. Not totally rare, but always interesting photographically. As the game progressed more rare things continued to happen. A bat was let go into the crowd. A fan fell onto the field. The ball got stuck in the catchers mask. Players made dramatic catches and tumbling over. It was a magical game photographically thus proving every game is just exciting as the World Series and must be viewed that way.